What do you do if you hate budgeting and aren’t good at it? Here’s how 2 guys who hate budgeting approach this problem. Both me and Ben hate budgeting, and aren’t really good at it, yet we have achieved financial freedom. If you’re struggling with budgeting and the standard tips haven’t helped you then this episode is for you. Budgeting can be really hot and at the moment I’m budgeting to try and save for a house among other things and so I decided to get some help from Ben Everingham from pumped on property, but it turns out that he doesn’t like budgeting either and is that necessarily the best person at budgeting? 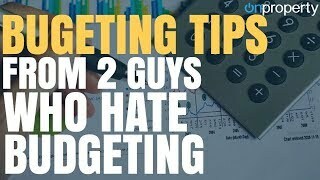 So we’re going to be calling this episode budgeting tips from two guys who hate budgeting because even though we haven’t been the best budget is in our life, we have both achieved financial freedom. I’m in different ways and we’ve done fairly well and we feel fairly confident in the way we do it. So this might be great tips if you’re like, I just need someone to teach me how to be extremely frugal and how to do that sort of stuff. But if you’re like struggling with budgeting and everything that the experts say doesn’t work for you, then we are your point of last resort. We are the place. You come here. Everything else doesn’t work. Just disclaimer, obviously this isn’t financial advice is for general educational purposes only. So yeah, so I’m trying to budget Ben. I’m trying to save money for house among other things and so basically I’ve got the idea of pay yourself first, which I think is really important and I’ve kind of got that down pat. Everything else are really struggling with. So maybe we’ll start with pay yourself first and then we can look at the other things. Um, the thing about pay yourself first from my perspective, cause like my wife just doesn’t even get budgeting, like she’s just got like made to make money or her making money and that’s like, you know, don’t even bring the word into our house. I like as soon as she does it, she’ll like self sabotage and almost like go the other way, which is why I obviously look after the finances and not my wife in the productive to budget. But I think, you know, like in terms of this concept of paying yourself first. I think I heard it from Tim Ferriss ages ago, like eight years ago. And it resonated with me. It’s much easier to go when I was ending it at thousand dollars a week. Um, when I finished university I just had this thing and I was like, I’ll say 400 bucks a week, which 40 percent of your income was a pretty significant amount now that I look back, but I also made the decision that once I’ve finished uni, I’d start living out of home. I’d moved back home for that first year and try and save a deposit to sort of speed the process up. So 40 percent was achievable then. Um. Is your expenses increase? Obviously not, but it has worked for me since then, every single week, regardless of how much I’m earning, I’ve always put away a certain dollar amount as, as I’ve earned more. I’ve tried to increase that dollar amount a little bit. And it’s funny when you, when you saving 20 grand a year or 40 grand a year, all of a sudden every couple of years you have a deposit for another house or shares or super or wherever your financial advisor tells you to place your money. I’m aware. Have you decided you decided to place your money where to place your money and you know, like you’ve got to do something with that money because it’s not doing anything for you in the bank and you know, my tendency was if I didn’t have a plan for it, for the pain myself, first money, I’d always find a way to go and a good holiday or do something else with it. So it was much easier to just have that plan and just stick to it if you know what I mean. Yup. And so that’s kind of what the way that I’m approaching it in my life because I know that when it comes to saving, like, but I know that budgeting isn’t my strong point so I can get real with myself and I can say that throughout my life this has. I haven’t been very good at this. I was great at it when I was a teenager and had no expenses except just living at home. I was able to save heaps of money, but as soon as I moved out of home, got married, had kids, there’s a lot of expenses to juggle. Kids are expensive, um, you know, and so kind of the pay yourself first went out the door when that happened. And so I’m getting back into that now. Especially running my own business. I feel more comfortable with paying myself first and then learning to live off the rest or finding ways to make more money so that we can get by. So for me, I’m putting aside money every single week a certain amount every single week that’s going into our savings account. And so that’s been put away, that’s being saved. And so it’s Kinda like I, I know within, I know within my soul that if I try and just budget and be really good and save whatever’s leftover after I budget, I’ll end up with nothing. Because as you said, it’s like, well maybe we’ll go on a holiday. We could do an extra trip to Sydney if we save a few thousand dollars, you know, and go and see family again. And you come up with ways to spend that money. So putting it aside and having a plan for that and having it locked away has been really helpful because I feel like if you don’t do anything else right, at least if you’ve saved that money aside and your whole other, the rest of your life’s in financial shambles, hopefully you’re not in debt. Like I don’t get in debt. That’s another big thing. Um, but yeah, like at least then I’m saving and then I’ve just got to work out the rest and live with it. The funny thing about paying yourself first is that builds momentum and it starts off slow, like anything, but it does snowball and it feels really, really, really good when you’ve got a little bit of a buffer there. And it goes from point. I think once you’ve got more than 40 odd grand in the bank where it’s less about spending it and more about continuing to grow. I think like that’s what I found like as soon as I got over that tipping point, 40 grands, too much to book a holiday or you know, in my world, like I only get on holidays for two weeks to a month Max because I get to itching on a holiday and I want to get back into using my brain again. But you know, like 40 k’s a lot to drop on a holiday. It’s too much to go out and spend on most things. So it’s like, oh, I’m just going to let this continue to go. And I think about myself like this wasn’t budgeting, saving. I hate those terms. Like I like investing, I like holidaying. I like looking after my family. They’re better terms for me mentally, but up to the age of 24, like I literally had $0 to my name. I was living wait to wake. I went on heaps of holidays. Like I went overseas, like don’t know, 10 or 11 times between 18 and 24. That was where my money would go to, but as soon as I’d achieved the goal of the holiday road, get on the holiday and spend it all or come back in like five to 10 k of credit card debt. And that wasn’t a good sock would have been. But when I met my wife, she was actually the amazing one. She would, she’d say she’d bought her own car, she had money in the bank. Um, she taught me how to do that and now she can’t do it and I can say I don’t know what happened there. it’s like debt or payment plan or anything like that. Even my wife went to a thermomix night, which if anyone has been to one of those comes home, we need to buy a thermomix. Apparently those things are pretty expensive. You’re talking $2,000 sort of thing as well. You can just do a payment plan and pay x amount a week, and I’m like, no, we’re not going to do that. If we’re going to buy a thermomix we I’m happy to save for thermomix and purchase it outright. Lucky. That’s all we need. Like we’re Vegan as well, so it would actually be very helpful to us. But in terms of payment plan, it’s just like I just steer clear of all of that so I find that helpful as well because at least then you’re not going backwards in your life. There’s two things there, like the first is I’ve talked to people that aren’t and 50 grand a year like I used to that bought two properties. I’ve talked to people that aren’t a million bucks a year and have zero savings, zero assets and zero clue of what they’re doing. There’s more money going in and coming, going out and coming in. So it’s not what you earn. As Robert Kiyosaki says, it’s what you do with what you own and having that pay sell first thing is huge. The second thing is I used to listen to this guy called Jim Roan. He had some interesting concepts on financial independence. He got financially independent by like 28 or something. And what he said was, you know, buy the first car after you bought the first property, like by the second car after you bought the second home. But that was a really good rule. Like I just invested first. I still haven’t really increased my lifestyle too much, I live in a slightly nicer house and I do have a car which I didn’t have a car for. Stephanie is, but you know what I mean, like it’s a good concept and good rule to sort of set for your own life at least during the acquisition phase. Yeah. And so, so the next thing is what we should probably talk about budgeting and how to talk about budgeting, how to actually do that because that’s what I’m kind of struggling with at the moment is just the tracking it and had to, like we, we looked at our finances so we can kind of work out. Okay, how much were you earning, how much, you know, what’s the fixed expenses that are going out, how much do we want to spend each week? So I’ve kind of worked all that sort of stuff out and then wait a week. I know it’s technically really easy to track how much you spend, but we just get lazy with it I guess. So what tips do you have around tracking it, if any? And is frayed budgeting apps that you can get that link directly to the card that you spend with and then it comes in and you just throw it to a category? Yeah, we tried that, but it was messing us up because we work weekly and then it was delayed like you’ve purchased something on Friday. It’d be delayed three or four days or the credit cards delays will like what? What? What is this payment for? I can’t remember what I’ve done, which has been very successful for me because everything I try and do is simple. Budgeting. Apps don’t work for me because I’m not disciplined enough to stick around with that stuff. I just am not interested. Wait to wake what’s going on on a year to year type person. But what I found when I had to be wait to wake that was good was I set up a pay yourself first account, so that was just an account that I didn’t have access to a card with that I had to physically go into the bank to get that money out of. That didn’t even show up in my internet banking site. I didn’t even know it was there. The second thing is I had a spending account which is my free money for fun and lifestyle, which if it went down to zero every week I was stoked because it meant that I like had a good time doing the stuff that I wanted to do and then I had an expenses in my life account which was just all the crappy stuff that we all hate paying energy, water rates, insurances, carline’s phones, Internet. $10 a week for four years because I was on centrelink plus, like the limit that, that allow me to work. And I used to get up to the supermarket counter every single week with like my ideal trolley with everything that I wanted. And then I get to the counter and I’d have to decide what was most important in life. Put away the other stuff. And every single week, like half the stuff that I wanted to buy was just thrown away. And it was so guarded, but every single week I live like a cow making your choices in life. I enjoyed that food because it was like, you know, I don’t know, it’s just crazy how things can change. But that level of each week the managers walk around going, keeps leaving all this food all over the place. What’s going on here? You know, like I wasn’t the favorite person at the supermarket but I had a budget of 100 bucks a week that I could spend on food and I had to be ruthless with it. And when you are that disciplined, it’s hard to overspend and it’s hard to not, you know, I had nine bucks I think your weight wait leftover after all the costs in my life and I’d get like a $50 loan from my roommate to go and smash beers with the boys once a week. So life I just think through this learner is. But like now that I’m earning more money than you know, 300 bucks a week, it makes everything feel. I’m grateful for it because I’ve done it so hard for so many years as well and it made transitioning into investing in property because I was used to going without certain things for a, you know, I just, I was just used to that discipline I suppose with budgeting. Saving. Yeah. So I think, I guess the message here is to find a system that works for you and everyone’s going to be different. last thing that we wanted to talk about is the way that we’ve dealt with our money problems in the past and that is go out and make more money would go just like. I know you just say that and show it sounds really easy, but we all know that it’s not easy to go out and make more money. But even just having that idea and that goal in mind. I remember when I was working full time, we had two little ones. Sorry. That’s all right. We had two young ones at the time and we were kind of, you know, right on that level where we didn’t really have enough money to get by and I would work full time and then I would spend time on the side writing a blog which eventually became on property and then finding different ways to make money online and looking outside of my job in order to make extra income. Or sometimes it was selling stuff on Ebay. Sometimes it went well. Sometimes they horribly, you know, I was constantly. I was working which would pay the bills. We kind of get by, but then I was also always looking to expand my life and expand my income in different ways, which eventually allowed me to leave my job and build my own business. And now I’m more free to explore different ways to make money. But I think no matter where you’re at, there are little ways and there are big ways to make extra money on the side. And that makes things a lot easier. When if you can bring more money in. There’s people listening to this today that have a income and 50 k. there’s also people that have a combined income of 300 grand. The thing about increasing your income is easy when you’re at the bottom of the income scale, increasing your income without starting your own business is harder. Once you get into that higher level, like once you go over about 180 grand per income earner in the household in Australia to go to that next level is tough, but hopefully if you’re making 360 k a year, you’ve got a surplus anymore. Pay Yourself first. You know, my thought process around what you just said is like there’s not a single job in Australia. I believe that doesn’t have the potential for you to earn more money within 12 months from today. Doing like when my staff say to me that they want a pay rise, I say, well, we have like, I’ll throw it back. How can you add more value instead of a week to week pay rise? How about we put a quarterly incentive there that if you do this, you get significantly more than a pay rise would be, but if you don’t achieve it, you don’t get the bonus inside. I’ve got no downside from it and I learned how to do that. About five, six years ago with my old boss, I went to him. I was earning good money at that point, like what I thought was really good money for my time and stage of life compared to what I had done a scene for a high rise and he said no. And I said, well, what can I do to make more money here because I’m capped out and there’s no future if I can’t keep drawing my income. And he said, we sat down and set these goals here in your franchise business, and he said, I’ll pay you $5,000 for every franchise that you bring in. And I said, challenge accepted and brought in like 25 in the first year. He expected me to bring in like 10 or something maximum, but I was like, you’re incentivizing me. I’m going to do it. Then we had a problem of like too many new franchises and delivery, but that was his problem because he has a business owner, you know, it’s kind of just there’s always a way and that could be earning extra income. It could be like I did for a lot of years. Taking on a second job could be finding another income stream outside of it. It could be if you’re at that right stage and have the right skill set, starting a business where if you know 60 percent of the monies going into your pocket, then you’re significantly ahead of where you are with the job. It could be going as a contract rather than a full time employee. We worked with a lot of doctors, it consultants, dentists and those guys go contract isn’t their income goes from 120 to 190 year almost straight away because they can also get terminated. Did anytime as well. There’s always a way if you just start thinking about how I can achieve more income as opposed to by NATO. Yeah. I think our brains are very powerful things and me and Ben were having a phone conversation about this the other day, but when you force yourself into a situation where you have to come up with creative ideas, you’re forcing your brain to focus on something, so if you’re paying yourself first and you don’t necessarily have enough to get by, but you decided, I’m not going to take out that money that I paid myself first. Then you start thinking about and your brain starts focusing on, okay, well how can I make more money? How can we make it so we can get by? Or if it’s like my wife wants a thermomix, it’s like, well, how can we make it so that we can afford that, and so instead of just adding on debt or taking away from your savings, you’re now focusing on how you can creatively earned more money in order to achieve something in your life that’s improving your lifestyle because you’re already saving. 100 percent, like I took one year off between finishing my uni degree and starting my graduate program because my now wife then girlfriend lace was like still studying and she didn’t want to leave study until she had finished, so I went and got a job. I’m in the local market I was living in at that time where I was getting paid I think 70 grand a year or something like that, straight away out of uni, which was much better than the Grad program. Then the next year I went into the Greg Program and took a massive pay cut, but I knew it would build the right sorts of skills and context that I needed to go to the next level longer term. So it was kind of. I’ve done this three times like I’ve taken massive pay cuts because I knew that in my twenties what matters is knowledge, skills and the foundation you lay, not the income and doing that. Now that I’m in my thirties, it’s exponentially sped up the process of earning better income, but I went into that Grove program ending 50 k going, this is awesome, but not like every other Grad that had been on 300 bucks a week. Like I had the year before. I’d been used to earning good money. And so that year I’m like, okay, I’m learning at least this amount of money. I remember I sat with the person on the first day and they said, what’s your goal this year? And I said to increase my wage by 40 percent because I like, that’s what I needed to do. And so she said, cool, this is what we need to do to do that. And I increased my grad wage, see liked by 65 k or something when everyone else was on 50 within like the first six months. And then I had a little business that was helping do some government work at the time where I want to $10,000 projects. And so by the end of that year, I think I turned over adk whenever I’m 85 grand when everyone else was making 50, which allowed me to achieve my goal of buying my first property, plus actually getting enough money to buy my second in the same year. Um, so again, like thinking about it creatively and just saying what you want man, like paypal, like when my staff come in and say I want to make more money, like let’s make it happen. I know there’s not everybody’s like that. If they’re not like it and you can’t go further and you’ve got the right skill set thing, you know, go work with someone that is going to value you as well. Like don’t be scared of making a jump. Don’t be scared of like taking a step back for a couple of years, reducing your income to get into a space. It’s going to longterm make you twice as much as you’re doing now either. You know, changing careers, changing jobs can sometimes be significantly better than just sticking it out. Like if I’d have stayed in it, my salary would be kept. But I went outside of it and you know, properties obviously can be whatever you want it to be really. And so yeah, I think thinking long term is key when it comes to making money. I remember I had a situation with a job that I was at. I’ve got another job and I was going to leave and then they offered me more money to stay and they offered me more money than the other job was paying. But I knew that other job had more upside potential and it would build more skills in me that would be better longterm. And so I ended up taking that and luckily you got an internal promotion within that and um, you know, build those skills and became more confident and more successful and stuff like that. So yeah, I think you guys can probably do more than you’re doing right now and me and ben believing you and we believe that there’s great things inside so many people and those like those Grad students who were just earning 50 k who are happy to just turn up and do job and earn 50 k and then they’re hoping and praying that one day their is going to raise. I mean their boss is gonna, give them a pay rise, but don’t be that person. Be The one who’s hungry, who’s like, how can I add more value to the business? How can I add more value to people’s lives and stuff like that. And that’s how you can earn more income. Like don’t just be happy to go to work, do the job, but look for ways to make more money either inside your job or outside. close off their guys. Not sure if this has been helpful or not. As I said at the start, this is budgeting tips from two guys who don’t like budgeting, but we do like building wealth, we do like financial freedom and all that sort of stuff, and so this is stuff that either we’re working on or that I’m working on or that we found helpful and so hopefully you found it helpful too. So until next time, stay [inaudible] positive. I hope you liked this episode guys. I got one tip out of this that is probably going to revolutionize my budgeting so it was completely worth it for me. I have that you can take one tip out of this as well. If you’re interested in investing in property and achieving financial freedom, check out this video that I did with Ben on four properties to financial freedom. If you’re on the podcast that’s on property.com, forward slash four eight, eight. Go there first episode I’ve ever done and don’t forget to subscribe to the channel.